According to 2T-physics, additional dimensions, one of space and one of time, can coexist with the familiar 3+1 dimensions. There are gauge symmetries that effectively reduce 2T-physics in 4+2 dimensions to 1T-physics in 3+1 dimensions. To grasp the relation between 1T-physics and 2T-physics, consider the many possible shadows of a 3-dimensional object projected from different perspectives on the surrounding walls of a 3-dimensional room. Similarly, according to 2T-physics, a unique dynamical system in 4+2 dimensions generates a large variety of 1-time shadows, and 1T-physics presents these shadows in 3+1 dimensional space-times as different dynamical systems in terms of different times. In this way, 1T-physics misses the underlying relationship between the shadows as well as the underlying properties of the higher dimensional space-time. But 2T-physics provides the missing information to show that indeed the d+2 structure of space-time governs all levels of physics, from macroscopic to microscopic scales, in classical and quantum systems, including the fundamental physics of the Standard Model, and beyond. The permitted motions in 4+2 phase space are highly symmetrical, as they are constrained by a gauge symmetry that makes momentum and position indistinguishable at any instant. Such symmetric motions in 4+2 dimensions are compatible with the way physics is perceived in 3+1 dimensions. There are no problems with causality or unitarity because the extra 1+1 space-time is removable by the gauge symmetry. One result of this new gauge principle is that it requires the theory to be formulated in a spacetime having at least two times. While taking exactly two timelike dimensions produces a coherent theory, investigations of alternatives so far rule them out, which seems to confirm the special status of 2T-physics. Recently, a field theoretic description of 2T-physics has been established. 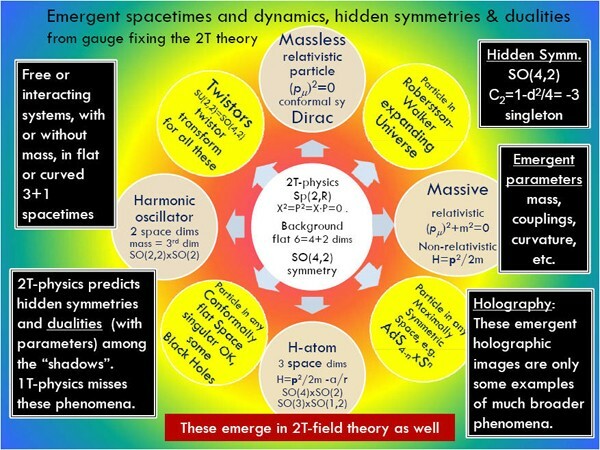 Amazingly, the best understood fundamental theory in physics, the Standard Model (SM) in 3+1 dimensions, is reproduced as one of the shadows of a parent field theory in 4+2 dimensions. Among the successes of the emergent SM is the resolution of the strong CP problem of QCD due to the more constraining structure of the underlying 4+2 theory. The emergent SM agrees with all aspects that actually work experimentally so far in the usual SM. The field theoretic studies of 2T-physics have been generalized to supersymmetric field theory. The more constraining structure of the underlying 4+2 theory is expected to have phenomenological consequences that could help to distinguish 2T-physics from other approaches in experiments at the LHC starting in 2008, if supersymmetry is found experimentally at the TeV scale. The results have established that 2T-physics is a structure that correctly describes, at least in principle, all the physics we have understood up to now. But 2T-physics also suggests the existence of new relationships and new phenomena. Itzhak Bars: "My current interests include String Field Theory (SFT), and Two-Time Physics (2T-Physics). My long term goal is the construction of the unified M-theory at the fundamental level. In 2006 I have established that all the physics we know today, as embodied in principle in the Standard Model of Particles and Forces, is described by a gauge fixed version of 2T-physics in 4 space and 2 time dimensions. My research is driven by some of the current questions in Cosmology, the Standard Model of elementary particles, and unification of forces including quantum gravity." AR (2007) This is exciting. I always thought time was ripe for a new idea, and this has the right depth and subtlety.